Do you remember how Mr.Pawan Ahir who managed to contact one of our SOKH TEAM Clients Mr. P Venu and asked him for his feedback about SOKHI TEAM ? He need to satisfy himself before joining us whether we are Fake or Real Traders. 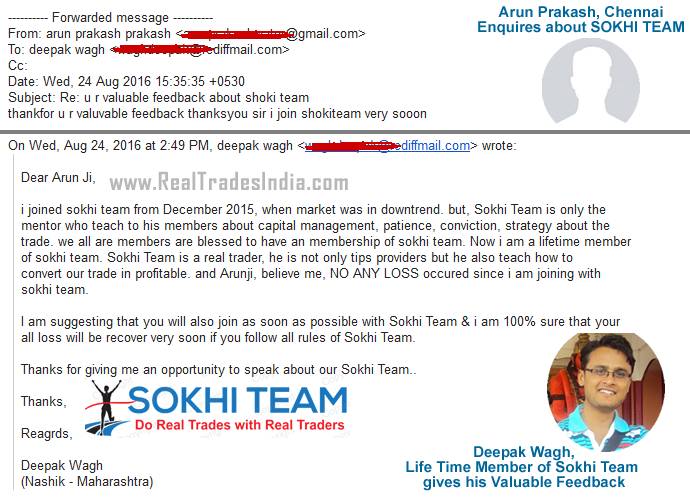 I thank Mr.Arun Prakash for going a Step Ahead and trying to find the Truth behind SOKHI TEAM and its due to his hard work that I am able to share this with you and all my 25,000+ newsletters subscribers. IMP : Our Youtube Channel now has over 4,000+ subscribers - Make sure you subscribe now [ Click here ] !